Arnold Black is probably unique in Scottish athletics. Most of us start off as competitors and then move on to other aspects of the sport; many also come into the sport because they are parents of young athletes before they graduate to officialdom and many come in as competitors because their friends bring them along. Arnold is in none of these categories and yet is one of the busiest and best respected: he is a statistician and administrator who came into the sport as such because that is where his interests lay. He is also probably unique in that there is no obvious successor as custodian of the website and the provision of statistics to the sport’s officials, athletes, selectors and supporters. 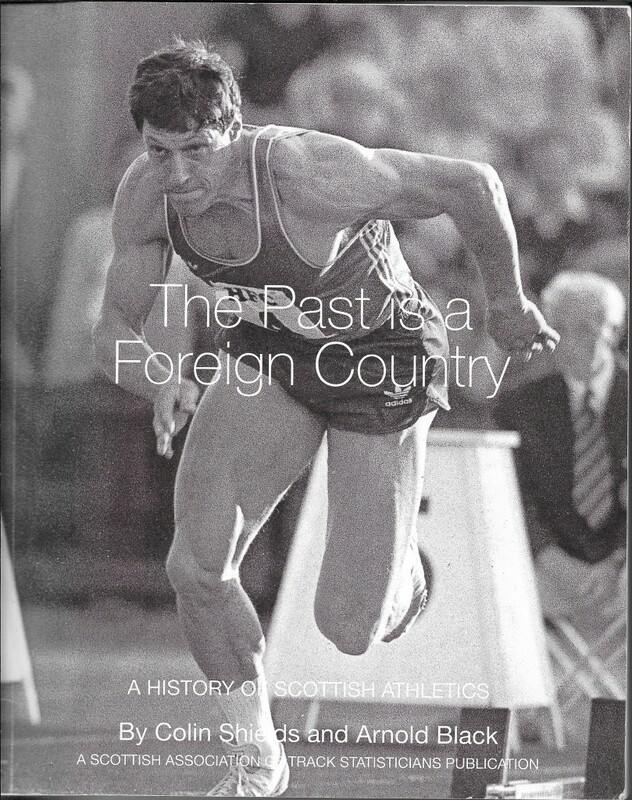 They were the mainstays of the Scottish Athletics Yearbooks for two decades and collaborated on the magnificent ‘The Past Is A Foreign Country’ book. They are well suited with Colin being really well known for his work on cross-country and road running (his centenary history of the Scottish Cross-Country Union “Whatever The Weather” being published to great acclaim in 1990), Arnold is more involved in the track and field side of the sport. Their collaborations have generally been of the highest order. The SATS performance tables on the Scotstats website are much appreciated: clubs have started them in scoring their championships, they are used to decide the Scottish club championship and Arnold has been working with Scottish athletics to fit them into a new Thistle Awards scheme. Although colleagues they are very different people with different backgrounds: while Colin was involved in the sport as a runner and official from the 1950’s, Arnold took a different route into the sport, never joined a club but has become a well known, respected and invaluable member of Scottish athletics. Coming from the South Side of Glasgow Arnold Black was born in April 1955 and educated at the prestigious Hutchesons’ Boys Grammar School and later at Strathclyde University where he graduated with a degree in accountancy. Thereafter he worked for a number of companies, becoming officially involved in athletics in April 2001 as a non-executive finance director and board director for Scottish Athletics Ltd for almost six and a half years until August 2007 while continuing to advance through his career as an accountant with Alexander Sloan, Chartered Accountants. Currently self-employed he acts as consultant, accountant and adviser to individuals, and charities. He has worked for over 30 years in this field for both business and in the not for profit sector. He has been a mentor for Project Scotland mentoring volunteers with working placement in the charity sector. 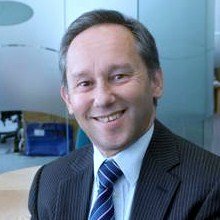 Arnold is also a charity trustee with Positive Action in Housing and with the MS Weir Trust (which also sponsors some athletes). “Arnold is the scottishathletics statistician keeping all records up to date and producing all the documentation required for selection meetings. He has a website where athlete performances can be found as soon after they happen as possible keeping the athletics community up to date. The Scottish Association of Track Statisticians has documented athletics performances in Scotland for 50 years through the publication of the Scottish Athletics Yearbook. 2009 was the last time the yearbook was published as SATS went online from 1/1/2010. The website produces weekly performances, rankings, athlete profiles, records and documents the history of the sport in Scotland and all this work is produced by Arnold. All coaches and athletes use the website as results can often be found on it prior to them appearing on powerof10. The website also identifies if a performance breaks a record or if it ranks highly in the years performances. Clearly a man of many talents, he is still not as well known in the wider world of Scottish and British athletics as he should be. With this in mind we asked Arnold about his career in athletics and he was good enough to complete a questionnaire on his involvement in the sport as a statistician. Can you give me some dates – when you joined SATS, when you became involved with Scottish Athletics (or was it the SAAA then?) “I used to go to athletic meetings and take a note of the results and keep my own ranking lists. I think I probably eased off when I was studying but picked it up again in the early 1980’s. When Scotland’s Runner came out for the first time in 1986, you’ll find a letter from me in issue 2 bemoaning the poor coverage of results. When they started including ranking lists (1988) it was for women (by Ian Steedman) and junior men (Jeff Carter). When I asked about senior men, they asked if I would do it for them, and my first lists were published at the end of that year. 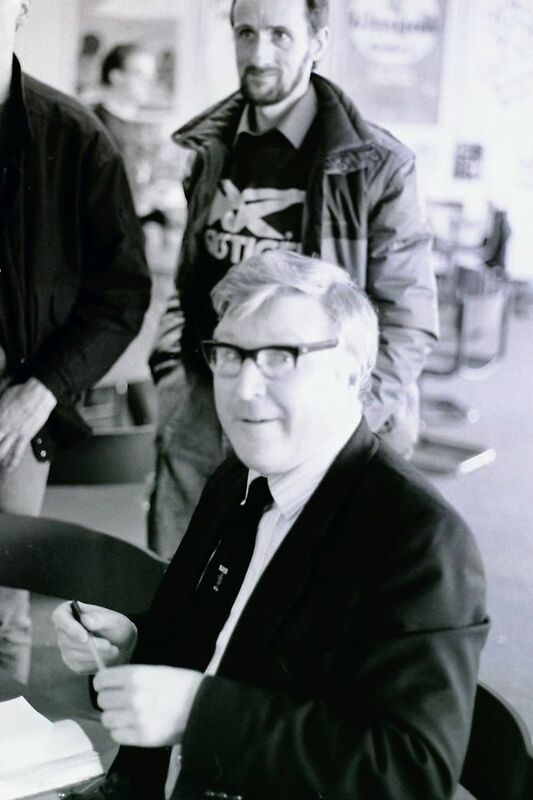 By that time (I’m a bit hazy on dates and sequences) Colin Shields had sought me out and I had joined the SAAA selection committee, under the chairmanship of the wonderful George Duncan. In 1989, the SAAA formed a Records and Statistics Sub-Committee, convened by Colin, to update the SAAA records and Colin and Myself have been on that Committee to this day, currently with Graham McDonald. Shortly after, I think I was appointed by the SAAA as their official statistician. The SATS Yearbook had not been published since the 1983 edition and in 1992 I was part of a group who had expressed interest in reforming the SATS. The membership of SATS at that time (as in the 1993 Yearbook) included Colin Shields, Dudley Brotchie, Ritchie Bunker, Robert Carrie, Fraser Clyne, Norrie Griffiths, Derek McGinley, Margaret McInally, David Morrison and George Young and we put ranking lists together to restart the Yearbook in 1993. At the turn of the century, I attended a Scottish athletics AGM by request from Colin to ask questions on a rather dodgy set of accounts. By that time (since 1993) I was a partner in the long-established Glasgow Chartered Accountancy practice of Alexander Sloan. Following the meeting, the finance director resigned and I was asked by David Joy if I would replace him. I acted in that (voluntary) role for a few years and stayed on the board for a year or so after. I resigned in 2007 after I fell out with the board over new selection procedures they were intent on bringing in. How did you and Colin get together? How often do you meet up these days? It would have been mid-80s when he approached me for the SAAA selection committee, I think. We live less than a mile apart so it was easy to meet. We worked closely on the book after which we both probably needed a break from each other. I see him mainly for our quarterly records committee meetings but speak to him at other times. Any more books in the pipeline? I’m hoping Colin and I can collaborate again later this year to put the book up on the website and continue to maintain and update it. But nothing else planned. Nobody has a higher regard for Arnold than Colin Shields who said that their friendship goes back to the days of ‘Scotland’s Runner’: when the magazine folded they got in touch about SATS and the reintroduction of the annual yearbook. Arnold took over the administration side being responsible for the production and printing of the yearbook (collecting stats, typing the whole thing out, getting the disk to the printers) while Colin did the summaries and did the advertisers since he knew most of the road race organisers. They worked together on the content with Colin doing the summary of each event that appeared at the head of the statistics. 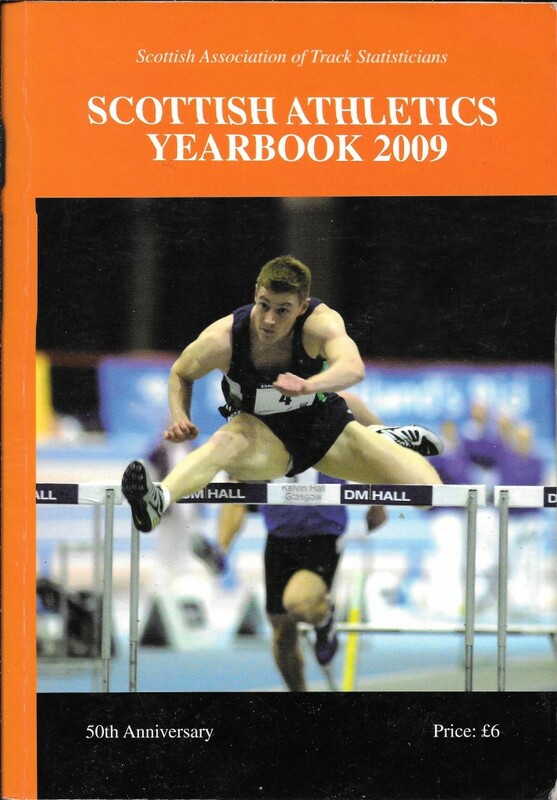 We speak of the ‘Scottish Athletics Yearbook’ but we also need to look at just what the two colleagues did. 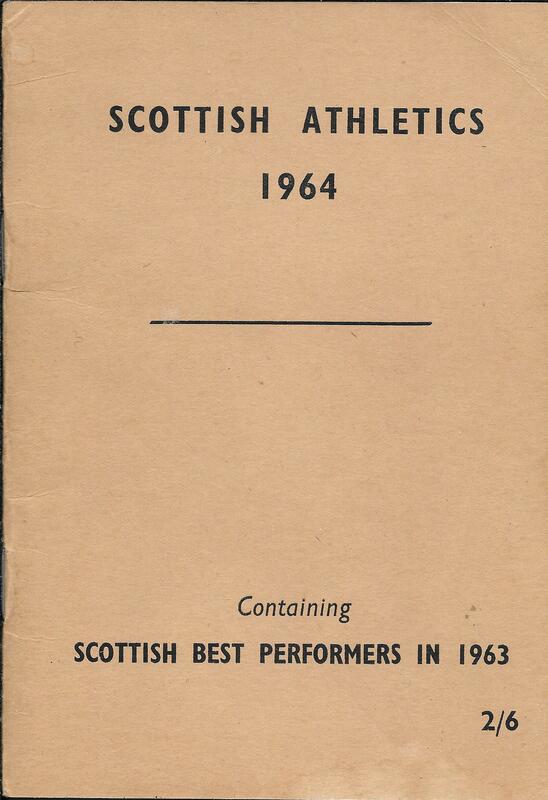 The first statistical booklet that I bought was ‘Scottish Athletics 1964’ and it cost 2/6d (12 1/2 p). It was smaller than A5 in size and ran to 22 pages plus the cover. It had been produced by Simon Pearson and was the fifth consecutive booklet that he had compiled. It covered only the top senior men and women and the depth in each event varied – for instance there were 33 in the 880 yards and 12 in the steeplechase. It was a valuable booklet in that it listed the top domestic performers and also had the marks of Scots living abroad. By 1967 he had enlarged it to 40 pages with a picture of Jim Alder on the cover. It covered Senior Men, Juniors and Youths (U17), Senior Women, Intermediates and Junior Ladies and Scots living abroad. The lists had one entry per athlete and the typical event section had (a) comments on the event; (b) results of championships; then for each athlete there was name, club, time/height or distance, position in the competition and date the mark was achieved. But Simon was emigrating later that year and he appealed for someone to continue the project. It appeared the following year (Scottish Athletics 1968) thanks to the efforts of Dave Keddie, Ian Steedman and Ian Cameron. The information for each athlete was as outlined above. It was more of a book and ran to 83 page and was liberally illustrated with a host of advertisements. Edited by Duncan McKechnie who noted that this was the 24th edition of the yearbook and thanked Ian Steedman, Jeff Carter and John Softley for compiling the lists and various others who had taken care of the production, advertising and photographs. The content had expanded to include all-time lists. records and best performances, commonwealth games results, international matches results, league tables, championship results and of course best performances for 1982. It really was a good production but there were no more after 1983 until Arnold and Colin set about producing the book again in 1993 following the demise of the ‘Scotland’s Runner’ magazine which had been assiduously printing ranking lists, etc, since 1986. The first joint production was called ‘Scottish Athletics Yearbook 1993 – statistical review of 1992’. It ran to 104 pages, by far the biggest ever, and included a lot of new material. There were Scottish national, native and all-comers records (mark, athlete venue and date) for all age groups, rankings (men, Juniors, Youths and Senior Boys; women Intermediates, Juniors, Girls and Minor Girls). For each event there was a comment on the event during the year and the standards within the event plus results of all district, schools and national championships, and then the individual rankings. This was another area where Black and Shields took a lot of trouble. There were separate columns for performance, name, club, date of birth, place in the competition, venue and date. Seven details for each mark. But they also began each list with the top 20 performances by Scots which meant that every good performance by any athlete could be seen, event dominance could be seen by the number of times a particular athlete appeared in the top twenty – eg in the 800m, Tom McKean had 12 times listed indicating a clear dominance. The book was a real pleasure to read and contained so much information. They went on in 1994 to turn out a book with a square spine that ran to almost 200 pages – almost double the size of the year before. SATS that year consisted of those listed by Arnold in his reply above but his introduction contained the interesting phrase “we have compiled these lists by pestering meeting organisers in our attempt to obtain 100% accuracy”, giving a clear indication that their role was more than a passive pen and ink task in the comfort of their front room. By now the yearbook included Commonwealth Games results, records, all-time best performances, 1993 Scottish champions, 1993 ranking lists, Veterans, Road and Cross-Country, 1993 international results, 1993 club competitions, indoor records and 1992/93 indoor ranking lists. There were many photographs and a number of advertisements. The yearbook continued to grow – demand was high and it was eagerly looked forward to from about February. I used to buy three copies – one because athletes always wanted to refer and would sit around before or after training scrutinising it – on warm weather training breaks it was always at any time of day being picked over by idle athletes – officials at sports meetings often wanted to look at it to check what the record for a particular event was, the second was to use myself, and the third was to sit on the shelf in case of emergency. By 2009 it was 322 pages long with a glossy cover, it cost £6 (compared to £2 in 1993), contained colour photographs and many advertisements as well as the information sought after. Contents by now included athletes of the year, club of the year, My Most Memorable Race (Lawrie Spence), The Vicissitudes of Olympic Year (Ron Morrison), Performance Trends 2002-2003, Scottish records, All time best performances, Scottish Champions 1989-2008, 50 years of Scottish Rankings, Guide to 2008 rankings, Senior and Junior Men’s Ranking Lists, Photograph Section, Senior and Junior Women’s lists, Scotland’s Jumping Wiomen, The Lessons of History (Doug Gillon), In Memory – John Innes, Masters Athletics, Road and Cross-Country, International Results 2008, Club Competitions 2008, Indoor Athletics, Index to Advertisers, Commonwealth Games 2010. So much in there – note that from three advertisers back in the 60’s there were now so many that a special index had to be included! The articles on the sport were always welcome but the guts of the book was always the performances by the athletes and this yearbook was the authoritative focal point for all of these. It really was a wonderful production and real shame when it stopped. A very good reference book had become in the hands of SATS, under the Black and Shields leadership an essential tool for anyone interested in athletics. As far as “The Past Is a Foreign Country” is concerned, both men wanted to put together a track and field book that would rival and complement the work done on ‘Whatever the Weather’. When they sat down to draw up the list of 100 names for part three, they agreed that every track and field event should have at least one representative. They each – separately – listed their own top 100: 86 names appeared on each list – a degree of agreement that it would take a statistician to calculate! But we’re not finished – after looking at each other’s remaining 14, they then listed their own candidates and found that they had agreed, sight unseen, on ten. Quite amazing. Not surprisingly Colin, like others I have spoken to, finds Arnold very easy to work with. An interesting fact about the yearbook is that every member of the Scottish team for the Commonwealth Games in Glasgow in 2014was given a copy when the team assembled at their Kilmarnock HQ, courtesy of Scottish athletics: they saw what they had to live up to! So far we have only been looking at Arnold’s activities in Scotland but a statistician as good as he is will always being demand. Arnold is a member of NUTS – SATS older brother – and supplies statistics to a number of other bodies including Trackstats. In this context he has been presented with the prestigious Richard Szretzer Award an international award for statisticians. This was hosted by the NUTS at a Dinner in London and Arnold was invited down and the presentation was made there. I asked his colleague, the highly-regarded international statistician Bob Phillips who stayed with Arnold at the time of the Commonwealth Games, said “Of course, I’d known about the excellent work that Arnold and Colin Shields had been doing regarding the history and statistics of Scottish athletics, now supplemented by the invaluable Scottish distance running website, but I had never met Arnold. In recent years, having moved to South West France to live, my contacts with domestic athletics in Britain had vastly decreased, but I still regularly attended major international meetings in various countries and I was determined to get to at least a couple of days of the 2014 Commonwealth Games, having first attended that gathering as a very youthful enthusiast in Cardiff in 1958. Of course there’s more to Arnold than athletics as you will see when you visit his Twitter account: oh, yes, he’s well into the twenty first century. It’s not just the website for scotstats – there is also a facebook page. 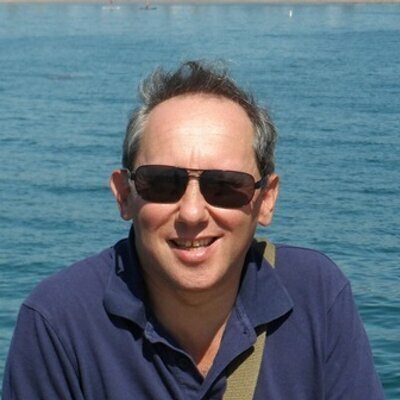 His twitter address is https://twitter.com/ArnoldBlack1 where he says he describes himself as “Rangers fan, athletics historian, chartered accountant. My tweets will mainly be about Rangers and Scottish athletics, not so much about accountancy.” He didn’t realise that he’d have fellow Rangers fans following him and tweeting about the club’s finances! Go and have a look and check out the scotstats facebook page at https://www.facebook.com/pages/SATS/179337328763234 – it is well worth a visit and has not just more information on the sport but different information with lots of photographs. Arnold has other interests out side the sport of course – indeed athletics was a form of relaxation when he took it up while working as an accountant full time, and when he was younger he played table tennis: a sport in which his father was a good standard player who represented Glasgow. Although he still does work professionally with selected clients, he reads a lot, mainly using his Kindle, and likes to travel. Indeed he has a property in Spain where he spends some time every year. Arnold will be a difficult act for anyone to follow.